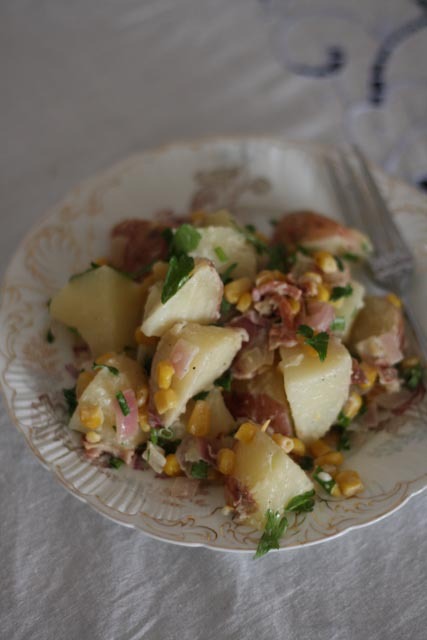 I think every 4th of July celebration calls for at least one potato salad to be present on the buffet table (we had two!) This was what I made for our BBQ last Wednesday, and I thought I’d share my recipe with you. Oh, and did I mention it has bacon in it? No? Well, it does. So get excited. As someone who grew up in Idaho, I like to think that I know a thing or two about potatoes. These little red babies surely did the trick. When you boil potatoes for potato salad, you want to be sure to avoid over cooking them (otherwise they get mushy and lose their shape). I favor boiling them whole, with the skin on. A) the skin is good for you (lots of vitamins!) and tastes great, and B) boiling them whole helps prevent overcooking. Just my two cents as a somewhat connoisseur of all things potato. This salad has it all: salty and scrumptious bacon, crunchy kernels of corn, fresh herbs, zesty onion, and a slightly tangy dressing with just a hint of mayo for a creamy texture without overpowering the other ingredients. 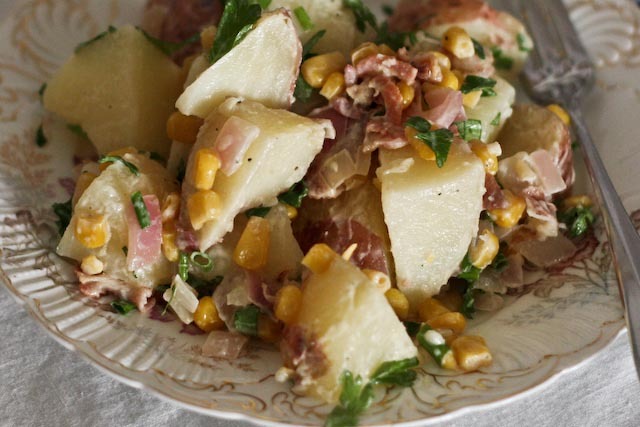 As potato salads go (and let’s face it, they don’t have the healthiest reputation), this one isn’t too bad for you. Well, maybe minus the bacon (but bacon makes everything better, so we’ll just forgive that – plus, it’s meant for celebrations like the 4th, so splurge a little and go for the bacon!) Enjoy, and share with lots of people who appreciate bacon as much as you do! Place whole potatoes in a large pot and cover with water. Bring to boil and cook for about 15-20 minutes or until potatoes can be easily pricked by a fork and are tender, but not mushy. 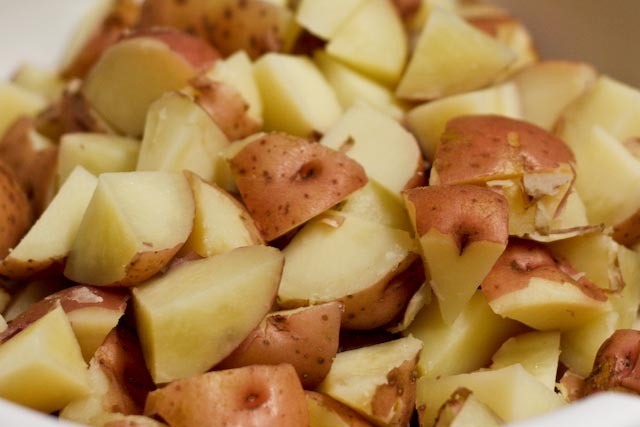 Take care to avoid over cooking the potatoes [note: potatoes may not cook evenly, and larger potatoes may require more time than smaller ones]. Drain potatoes and let cool for at least 15 minutes. 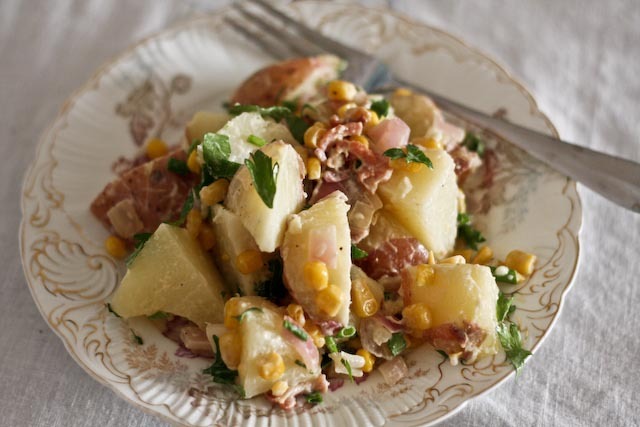 Cut potatoes into cubes and put into a large mixing bowl. Meanwhile, cook bacon in a saute pan over medium heat until just crispy. Drain the bacon fat and return to pan to heat. De-glaze pan with 1 tbsp of vinegar. Add onion and cook for about 5 minutes or until just translucent. Add bacon and corn and cook for another 3 minutes or so, stirring often. Remove from heat. In a small bowl, whisk together remaining red wine vinegar, mayonnaise, mustard, salt and pepper. 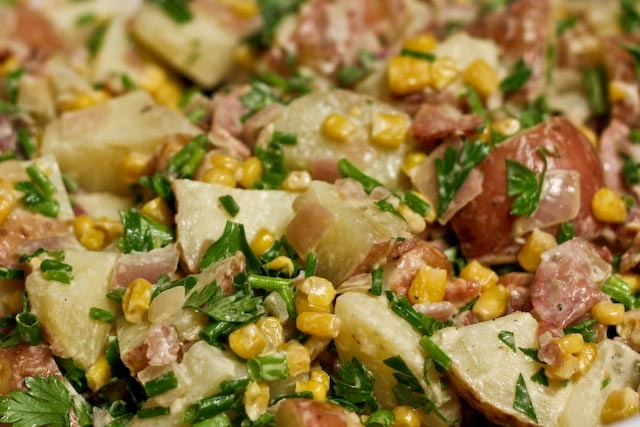 Add bacon mixture and fresh herbs to potatoes. Drizzle with dressing and toss to combine. Serve room temperature or chilled. Serves 15-20 with side dish size portions (about 3/4 cup).